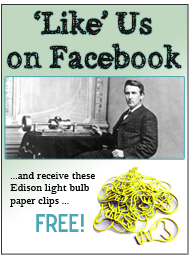 New Book about Thomas Edison is a Keeper! In October of this year, I celebrate a very interesting 55-year anniversary … when I became a Thomas Edison groupie. I was 10 years old when a school project exposed me to the great inventor. My boyhood hero propelled me toward a career as an engineer/inventor. Today, in retirement, I am a docent at the legendary Thomas Edison National Historical Park [TENHP] in West Orange, NJ; and also serve as an advisor and author for the Edison Innovation Foundation. I have read all the major books on Edison, so believe me when I tell you the new book Edison and the Rise of Innovation is a real keeper. Lenny Degraaf, an archivist at TENHP, and author of this new volume, does a wonderful job weaving together an interesting new perspective on the world’s greatest inventor … and the crisp photos are a real treat for the eye. 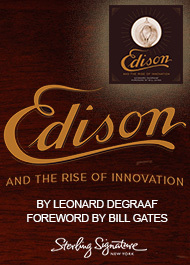 As an added treat, the foreword to the book was penned by Bill Gates, himself an ardent Edison aficionado. The public recognizes Thomas Edison as one of history’s most influential inventors, but his work as an entrepreneur, manufacturer, and business manager are less appreciated. He did more than solve technical problems in the lab. From the 1870s to the late 1920s he created and managed dozens of companies to produce and market his inventions. To promote his innovations, Edison raised capital to support research and business operations, created manufacturing facilities, pursued patent and legal protection, and implemented marketing and advertising strategies. 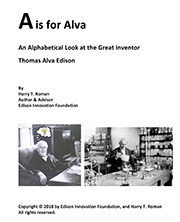 In this book, Mr. DeGraaf considers all of these activities, tracing the development of Edison’s inventions, and providing readers with a more complete, coherent and balanced narrative of the great inventor’s accomplishments–showing also how Edison’s approach to innovation changed with time. Edison is important because he allows us to address broader questions about how inventors and business leaders approached innovation in the late 19th and early 20th centuries. He was part of a community of inventors who shifted innovation away from lone tinkers and mechanics to business managers, professionally-educated engineers and scientists working within formal research organizations and corporations…what would transform into the modern day, and ubiquitous, new product development project manager. These mythic inventors of the late 1800s changed the invention landscape, allowing consumers to re-make the texture of innovation–making decisions about which inventions to adopt. Edison and his competitors and colleagues were influenced by the times: improved transportation and communication network; the rise of modern business corporations; national consumer markets; new advertising techniques; and, the increasing economic and social importance of cities. Mr. DeGraaf captures this in an intricate weave of the times, its concerns, and a public enamored for the first time with technological choice. As you work your way through this lovely book, remember, Thomas Edison is a very hard act to follow—not just because of the large number of patents (1093), but the magnitude and significance of his work. Edison is responsible for our modern society. Life magazine in 1996 proclaimed him the Man of the Millennium. His 2010 cover feature on TIME magazine echoes this theme, and documents his continuing relevance to the world. 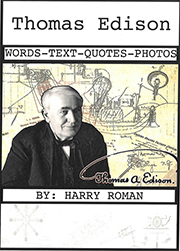 Recently the Voice of America proclaimed that Edison’s accomplishments are the basis for one-fourth of the jobs on the planet. Schools are once again studying Mr. Edison and his work, allowing students to have a much better grasp of technological innovation, and the socio-institutional forces that shape it. The great inventor is a prime argument for why our academic curricula should be more integrated. Recently the educational community has come to realize the importance of infusing the schools with a STEM-based education [Science, Technology, Engineering and Math], an integrated curriculum philosophy that encourages students to solve problems from a multi-dimensional, multi-disciplinary perspective. This is exactly the kind of analyses that Edison employed in his inventive and entrepreneurial pursuits at West Orange almost 125 years ago. Edison remains ever-relevant, and a role model for the legions of inventive minds that continue to be inspired by this most inventive man. Enjoy this book and explore how Edison’s work so many years ago, continues to echo down through the decades, much to our continued benefit and inspiration.